My earliest memory is of my second birthday. 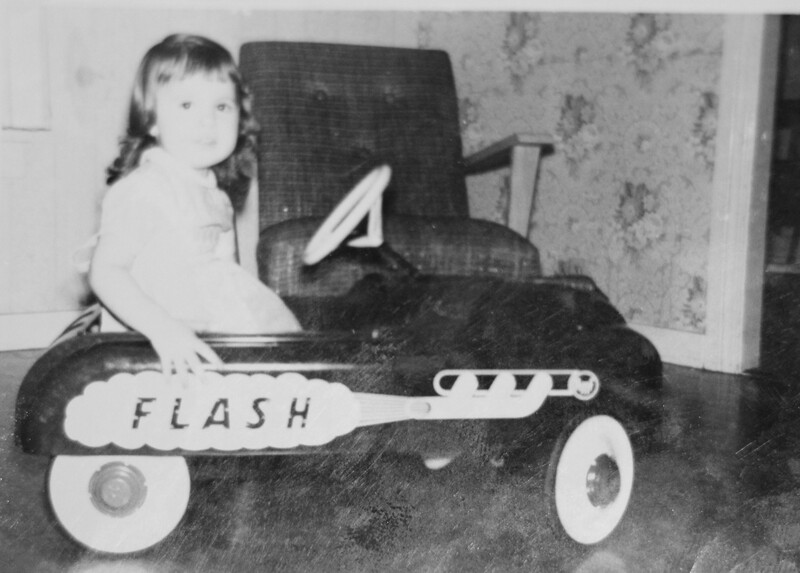 Mom and Dad gave me a shiny red pedal car. I can’t describe the joy I felt at having my very own car, I must have been glowing. I climbed inside to take it for a spin, only to find my feet didn’t touch the pedals, but I that was okay, I knew I would grow into it. “I’ll trade it for a tricycle,” Dad said, and Mom agreed. “No! I don’t want a trike, I want the car, my legs will grow,” I thought, but for some reason, I didn’t tell Dad. I was terribly disappointed when he took the car away. That positive attitude has stuck with me all my life. If I want to do it, I find a way to make it work. But even though I have confidence in myself, it hasn’t been easy for me to be confident in how others perceive me. I have always worried that others will think I’m silly for believing myself capable of a thing. When my first marriage ended in divorce, I felt as if everyone looked down on me. Even God. I focused on my failures. Though I condemned myself, and thought God could no longer use me, I still prayed and read my Bible daily. Then one day God spoke to my heart, “Martha, I never intended for you or anyone else to divorce, but no one is perfect, including you. That day, I know for sure I glowed with happiness, as tears of joy ran down my cheeks. The words of Psalm 139 that I was so familiar with, took on new meaning as I read them that day. And today, as I read the psalm again, I am assured that God knows everything there is to know about me. He knows all my thoughts, my plans, my desires, and my fears. God knows me better than I know myself, and He accepts me as I am. Several years ago God gave me a desire to write. I had always used writing as a learning tool, but this was different. Now I was writing with purpose. I asked God to show me what He wanted me to learn as I read my Bible each morning…and I wrote. I found myself writing bits and pieces of my thoughts and my life. I poured my stories out on the page, a little at a time. But it seemed God was saying to me, “You’re writing what I want you to, just keep writing.” So I did. An amazing thing happened. As I read my writings, I saw the protagonist, the main character of those stories, through different eyes. As she shared her heart, I related to her. I understood her. I accepted her. As I began to understand myself, I found my writing voice. In Part 1 of Baby Steps to Blogging, I talked about three steps to help you get on the right baby foot with your blog. Today I will start with an example—my own blog. Platform. I chose WordPress.com as my primary blogging platform. WordPress has tutorials to help you get started. You can choose from over 150 free themes. Pick one you like and get started. You can always change it later. I chose one I could add a picture header to. I used a photo I took while on a nature hike with Joe. I enlarged it and cut out the section I wanted for my header. I made several copies of it on my computer so if I ruined one, I would still have one to work with. Note 1: When editing a photo, NEVER use your original, or your last copy. ALWAYS keep a file of originals to work from and make more copies as needed. Note 2: It is not essential that you use a picture header. If this sounds like a giant step to you, leave it out until you are comfortable trying it—even if that is never. Focus / Mission Statement. Make a list of the subjects you have written or want to write about. From my own list I discovered that I am passionate about sharing the importance of having a relationship with God with others. I want to share it with family, friends and the world. I am passionate about doing this through other things I love: writing, photography and teaching. Helping others find their passion by sharing my own. I added this statement below the name of my website on my header photo. You can scroll to the top of this page and to see what it looks like put together. It took a lot of patience for me to get my header the way I wanted it. I am not good with a computer. I have just made up my mind not to let it get the best of me. I take breaks when I get frustrated, but I don’t give up. If you aren’t ready to get this involved, you can simply use the name of your blog and include your mission statement. It isn’t that big a deal. There is nothing wrong with simple. In fact, simple is often better. Begin Blogging. Finally the easy part—what you wanted to do all along. Write! Let your readers get to know you. Tell them your passions, admit your failures. Let them know what you like and what you don’t (without being ugly about it, of course). They don’t want to know how perfect you are, but that you are a real person, just like them, or their aunt or grandma… Write stories about something funny or embarrassing that happened to you. Tell how you learned from your mistakes—or at least what you are trying to learn. The post International Coffee Day, was about a mistake I made—one I should have learned from. You can click on the link to read it if you missed it. The very next day, I made the same mistake again! It was aggravating. I felt like a dunce. Now, with all this in mind, make a list of all the things you can think of to write about. Jot down a few notes about each story. I like to put mine on note cards so I can flip through them when I need an idea. Find a time to sit down for a couple of uninterrupted hours and write about one or more of those subjects. Try to do it a few days before you intend to post. Make a habit of doing this and you will always be ready with something to post. Take the time to read through it and make any needed corrections before posting. Your goal should be to give visitors to your blog something worth reading. Whatever you write, make it interesting enough that they will want to come back for more. It never hurts to add a bit of humor, even if the joke is on you! You are doing a great job! It is work to set up a blog. Don’t get discouraged. After all, if you had never began to blog, you wouldn’t have made it this far. Give yourself a break. Ask questions. Keep writing. Blog with confidence—in baby steps. Your story is waiting to be told. This post is part of a series titled Baby Steps to Blogging. I hope it will help you on your blogging journey. I encourage you to share your thoughts and questions in the comments section of this post. You are invited to come back next Thursday for Part 3 of Baby Steps to Blogging. Choose to follow me by e-mail if you would like to be notified of new posts to my blog.